This race was going to be my big goal race for the fall. My first true test of speed after having my son a little over a year ago. Going into this race I had a few months of really solid training, thanks to hiring a new running coach back in July. 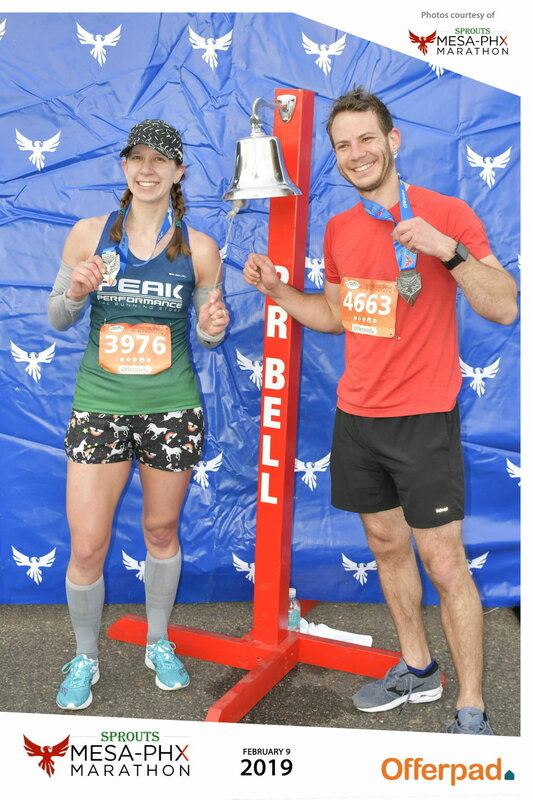 If you’ve read some other race recaps, you’ll know I had a coach to help me get ready for my first marathon in April 2014. It wasn’t a bad experience per say, but it made me hesitant to hire another and it was one of the reasons why I wanted to become a coach myself... to be a better coach and provide a better experience than the one I had. I had a great chat with my current coach leading into this race and she truly believed I was capable of meeting (and maybe beating) all of my goals I had set for myself based on my training. Bib pick up at the expo! Love the free race photos. Quick in and out, and back to our hotel. We headed to the race expo on Thursday afternoon, so that Friday we could relax and spend a little time exploring the city. Going into race week my family had been in Nashville as my husband had a work conference. I got some solid runs in there but had spent more time on my feet than I had expected, so I really wanted Thursday and Friday to be about relaxing as much as I could so my legs would feel as fresh as possible. I knew to hit my goals, this race would have to “hurt” and I had to be willing to make it hurt. Race morning dawned cool and crisp, but race start time wasn’t until 9:45 am for the half marathon. Truly, I was totally on board with this! I typically head out for my long runs around 9 or 9:30 in the morning, so this felt normal to me! I was able to enjoy a great waffle from the hotel, orange juice and banana before heading out for a 15 minute warm-up jog about an hour before the race start. After the jog, I hit the port-o-potty lines. They weren’t too long yet which was greatly appreciated! My body always seems to know it’s race day… if you know what I mean! Elevation chart… they can be so dramatic and somewhat deceiving, don’t you think?! I finished my warm-up with drills and strides with about 15 minutes before the race started. I felt primed and ready to go, but nervous about finding that uncomfortable zone and hanging on to it as long as I could. After I headed to the start line I took off my long sleeve throw away shirt and waited for the gun to go off. Thayne and Parker weren’t there yet as start time was close to Parker’s morning nap. They would find me at the finish line though, and that’s what counts! In my pre-race chat with my coach we came up with a pacing plan and we knew (based on the elevation chart) that it would be challenging, but definitely do-able to hit my goals. She had full belief that 1:42 was more than possible as long as I was willing to work for it. 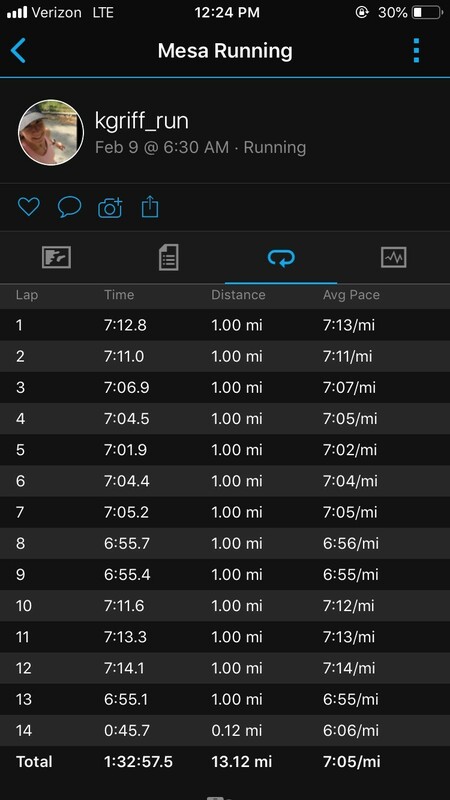 My speed workouts leading up to this race really had been more about building strength as they’ve all been at my threshold pace and steady effort, versus a sprint type of pace. I actually did the math to see what the average incline was going to be from miles 3-6.2ish. With the downhills included, it only came out to be about a 1% incline! That’s not too bad! Start line of the half marathon. The half started half way through the full marathon course so we would have the same finish line. I was able to line up pretty close to the front of the start line, and then suddenly the race was off! We had a small incline right away, and I knew that since we were starting near the city and heading straight into the tall buildings that my GPS probably wouldn’t be accurate right from the beginning. I needed to just go off effort and keep my heart rate in check. My coach had said to begin around 7:45-7:50 pace and try to build as the race progressed making the last 3-4 miles really hurt. We also discussed not looking at my watch during the uphill portions because it can kind of mess with your mind if you see your pace slow, but your effort stays the same or is increased. But you can “make up” that time on the downhills if you keep your effort similar. My watch ticked off the first mile at a 7:07 (oops… too fast!) but I passed the first mile marker around 7:28 in total time (closer, but still too fast!) Mile 2 flattened out, but I was still a little fast at 7:20. I didn’t feel like it was forced or I was running “out of control” so I decided to go with it. Mile 3 had a big downhill and ticked by at 6:54 pace. I knew the next few miles would be climbing though and considered this to be somewhat banked time. I decided to not look at my watch until I heard each mile beeps and go solely on effort and feel. Now, I am definitely not an advocate on starting out fast and trying to bank time in a race. I really think it’s better to start a bit more conservatively and build as you go. But sometimes you just feel good and have to roll with the punches you’re given on that day! So, roll with it I did. Not all race photos are fabulous! At least they’re free! The “oof, I’m getting tired but am so close to my goal so I better keep pushing!” face. Ha! Miles 3-6 were 7:16, 7:00, 7:33. Mile 6 was the steepest climb in the first half of the race, so I expected this mile to be slower anyway. I was happily surprised I was still in the mid 7s! I knew we’d have about 2 flat miles as we circled a lake near the city. I found a good group of other strong ladies to run with and tried to tuck behind other runners when we headed into a bit of wind. Both miles 7 and 8 were 7:16 pace. Not too bad! Once we hit mile 9 I knew all the climbing was over except for one more hill close to the finish. I’d worry about that when I got there… but for now decided to keep cruising and pushing the pace. I was on pace for that sub 1:40 shoot for the moon goal! Mile 9 was 7:31 and 10 was 7:30. I still felt good but could feel the fatigue coming on. Only a 5k left! The real race has started. Mile 11 had a good flat stretch into a slight downhill and brought a bit faster pace at 7:08. I knew that last hill was coming and when I started to climb it I started to have the first negative thoughts enter my mind of the entire race. Usually, this hits closer to mile 8 or 9 so I was thrilled to be this close to the finish before these thoughts crept in. I just kept telling myself that I was strong and capable and was almost (thank goodness) there. My 12th mile was 7:19. Only one to go, and downhill from here to the finish line with one left hand turn! My last full mile was back to 7:09 and I pushed with all I had to the finish line from there. Thayne yelled at me from somewhere in that last push and I saw him and Parker just before I sprinted (well, it at least really felt like sprinting) past them. It was great to see some familiar faces. My watch says my last push was 5:38 pace (HA… I doubt it) but also had me at 13.27 miles overall. From the first mile my watch was already .08 off in distance, and stayed that way until about mile 12, where it picked up a bit more added distance as we came back into the downtown high rise buildings area. So while I’d love to think my final sprint the finish was in the 5’s I know it wasn’t. Not too shabby!!! Official race results. I was THRILLED with this race and the end result. My current half marathon PR is from Louisiana in 2016 where I ran a 1:34:58. That course was fairly flat and 2016 was the year I felt unbeatable, PR’ing every race distance I ran that year. 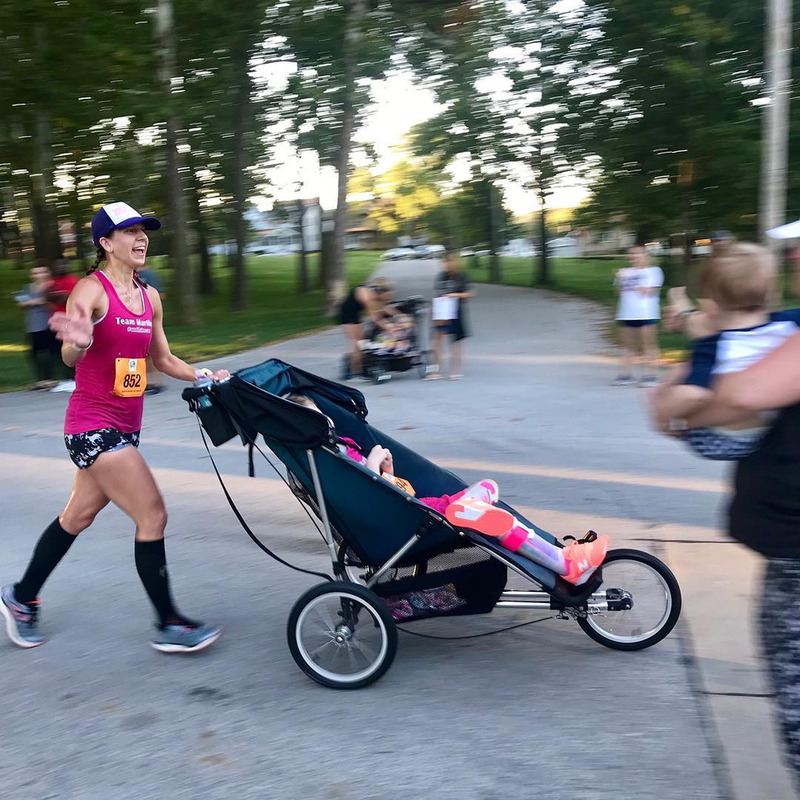 So to finish this challenging, hilly race feeling good and within 60 seconds of my PR at only 13 months postpartum… to say I was ecstatic is an understatement! Officially I ran 1:35:51 for 7:19 pace overall. I texted my coach and she was SO exciting, asking me to call when I had time. It’s such a great feeling to have someone else feel confident in your goals and dreams (my husband very much so believes in me too, by the way!) and to help you feel like they are achievable as well. 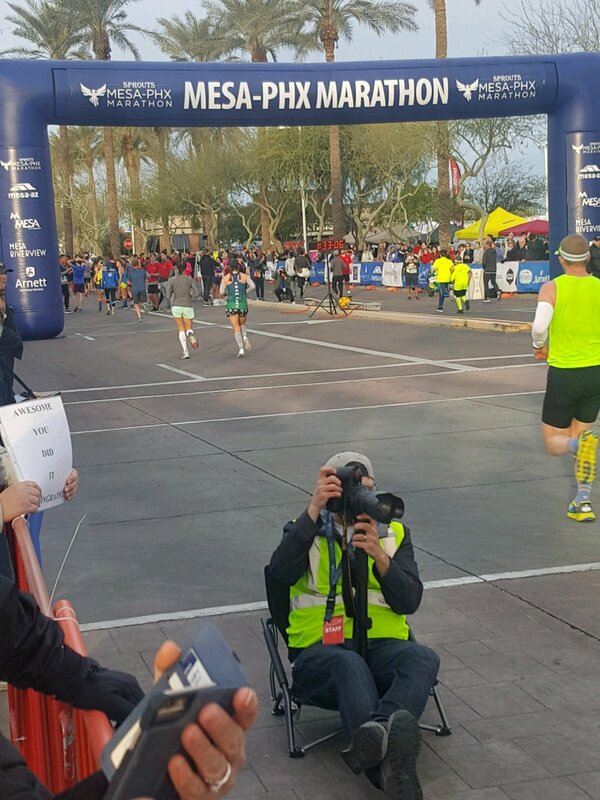 I know that in 2019 I will break my half marathon PR and I can’t wait to see what comes up next! Also… this race was my birthday gift to myself. I’ve never ran a race ON my birthday, and I couldn’t be happier with the result and choosing this race as a way to celebrate myself. Sitting down felt amazing! Plus the medal is pretty cool. The crab opens up to show a skyline of Baltimore. To go back to race report archives, click here. This race will always be so special to me. It was half marathon number 22, state number 18, but most importantly… my second half marathon pushing my cousin Martilee. (Our first race together was in Iowa!) I signed up for this race months ago (as usual) and asked my aunt Vanessa if it would be okay if Martilee could also race. She loved the idea, of course assuming Martilee stayed healthy enough. Martilee has Rett Syndrome, which has stolen so many things from her, including her ability to walk. There have been many races that I’ve ran for her and raised money to fight against Rett Syndrome, and I plan to continue to do so until there is a cure. Race morning showed up a little warmer than I’d hoped at close to 70 degrees before the start, plus fairly decent humidity levels. This race wasn’t about me though, so I didn’t have any specific time goals going into it. I also knew that Martilee and her jogger were close to 130 pounds… but luckily this race in Omaha was fairly flat, unlike Des Moines! Waiting to start the race! Martilee and I lined up in the corral right around the 1:50 pacers. I was hoping that we wouldn’t have to dodge around too many people in the beginning of the race. We headed out on the run and found one of the few hills of the race right away! The sun hadn’t fully risen yet, so the race was still a nice temperature. My training had been going really well leading up to the race (I hired a coach in mid July) and I was feeling good about starting the race in the mid to upper 8 minute range. When running on any of the flats, Martilee and I could keep a nice pace without feeling like I had to put too much extra effort into the run. The course was an out and back, along a nice wide road. About half the race we were only allowed in one lane, and the other half of the race we had the entire road blocked off just for us. I was really grateful for this as it was a little more crowded in the beginning than I expected and Martilee and I had to navigate around other runners quite a few times. We tried to be as respectful as we could and not get too close to anyone’s heels. But it can be really hard to navigate a heavy stroller! After the first hill right at the beginning of the race, it stayed fairly flat for awhile. Even though the course was mostly flat, it had a few false flats which were almost worse than the hills because you could never seen when they were ending! I’m sure I felt them more with the stroller than I would have without. Around mile 5 we went by this beautiful little park before entering a northern suburb of Omaha. There weren’t too many race spectators so far, but this is where most of them were, including our family! It was so nice to see everyone and hear them all cheer for Martilee. She was off to a great start and running really well for the first 5 or so miles! Martilee and I around mile 5 of the race. Feeling good! At the turn around for the half marathon, the full marathon runners kept going straight. The nice thing is this narrowed down the amount of runners by about half! It was also really neat to see everyone else still heading out to the turn around point and how many of them cheered for Martilee and told her how awesome she was doing! Flying by around mile 7.5-8! Heading back to the finish line! After we saw our family the last time (until the finish) around mile 7.5-8ish the race started to get a little rough for me. The sun was up, the temperature was warming up, and Martilee was starting to get heavy. I was getting tired… and needed to dig deep to finish the race. This is when I started talking to Martilee. On the uphills, when I was walking, I talked to her. I told her how many miles we’ve ran, how many we had left to go, and what an awesome job she was doing. So many people passed us on these hills and offered help or amazing words of encouragement. Entering the baseball stadium for our last lap around the park before the finish line. The race continued on, back the way we came. The police were amazing at blocking all the intersections and keeping us safe the entire race. The volunteers were also amazing with offering water and heed. I had my own bottle of Gatorade, so only took water to help keep me hydrated through the race. We made it through the last few miles, running when we could (on the flats), sprinting when the opportunity arose (hello, downhills and giggles! ), and walking when we needed to (up hills… ugh!) We continued to pass people and have people pass us. Spectators cheered for Martilee and she continued to be my motivation while I continued to be her legs. The last part of the race was a lap inside the baseball stadium at TD Ameritrade park. Once we entered the park to make our last loop we could hear so many cheers for us to finish strong. It felt amazing to hear everyone cheering for her and us! Rett Syndrome… you're going down! We did it!! Love you, sweet girl. We were interviewed by channel 7 news in Omaha! We finished the race, got our medals, and then someone from Channel 7 news in Omaha asked if she could interview us! I called down Martilee’s parents so they could give approval and then also assist with the interview and give more information than I may be able to give. I often feel like I need be doing more for Rett Syndrome awareness and feel so blessed when an opportunity to share Martilee’s and my story with so many people comes along. You can watch the clip here. Once the race was over we waited for the awards ceremony. Martilee ended up taking first in her age group and came away with about a minute PR over our last race together! We finished in 1:57:52 (8:55 pace). I’m hoping we can run another race together again soon. I’ll continue to be Martilee’s legs for as long as needed… but I have so much hope that there will be a cure for Rett Syndrome soon. I’ll keep running for her and with her because I know someday she will get to run with me. I’ll keep going #untilshecan. Nebraska is now finished, and Maryland is coming up next! Hanging out after the race!